Last night, I finally sat down to catch up on my blog reading. I am SO behind! I think I only made it through the A's and B's. Have you been over to A Field Journal? I LOVE that blog! Do yourself a favor, and head on over for a peek. Isn't her dollhouse amazing? When I was in first grade, I broke my leg while ice skating - and that year for Christmas, my parents spent hours assembling a 3-story dollhouse kit. It was the perfect gift, since I had to do a lot of sitting anyway. I spent decades playing with that piece. 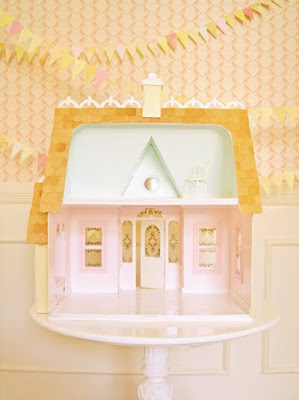 Kalia is going to receive the same dollhouse in a couple years, and I can't wait to spend time decorating it together. 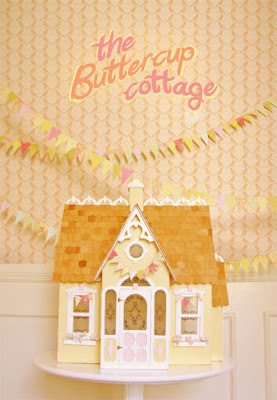 Mine was gray with a black roof, but I just adore this yellow and pink cottage. Do you have a dollhouse?